I had the most amazing Labor Day weekend -- I gained a brother and saw my sister look the most beautiful I've ever seen her on their wedding day! With the holiday behind us, I can't believe that it's time to stow away the white jeans and the bathing suits ... Starbucks is officially serving their Pumpkin Spice Lattes and I'm getting used to the sound of a football game going on as the ever-present background noise in our house. 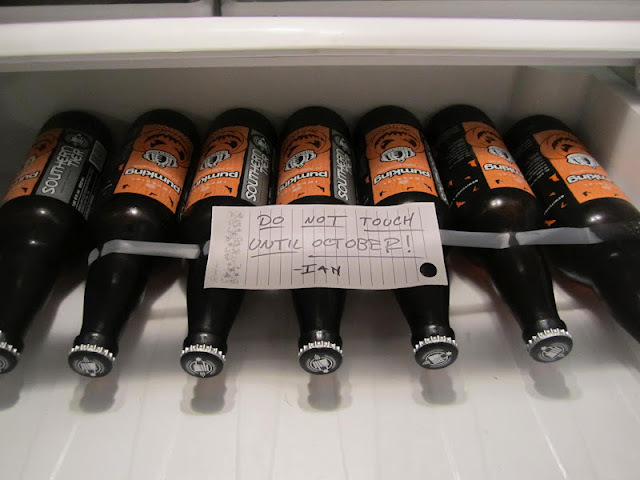 And speaking of cooler temps and the switching of the seasons -- my husband takes his seasonal brews very, very seriously. I mean ... have you ever?! Are you looking forward to Fall and all of the fun things that come with it? Haha, I like that he signs it "Ian"...in case there was any confusion about where that directive came from! (Especially in a house of two adults!) Love it. On my way to Starbucks now for a little indulgence: Pumpkin Latte!! Love that sign in the refrig. I saw those beers at whole foods on display and was thinking they were probably yummy. What willpower he has to wait until October! I am off to Starbucks! YAY! That's awesome :) I will have to get those to surprise the Mr with. He is a beer snob. Im so excited for fall this yr more than any! 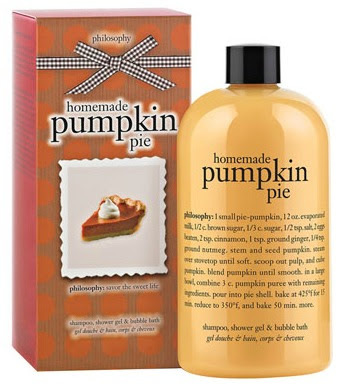 Pumpkin anything, count me in! The beer and Philosophy both sound wonderful! Can't wait to hear all about the wedding! Ha, is that what that background noise is I hear every night? Yep, its that time of year! Too funny about the signs on the beer! I will miss my white jeans but I am SO ready for fall this year. Love this! I can't wait to have a pumpkin beer once I have this baby. They are my hands-down favorite! 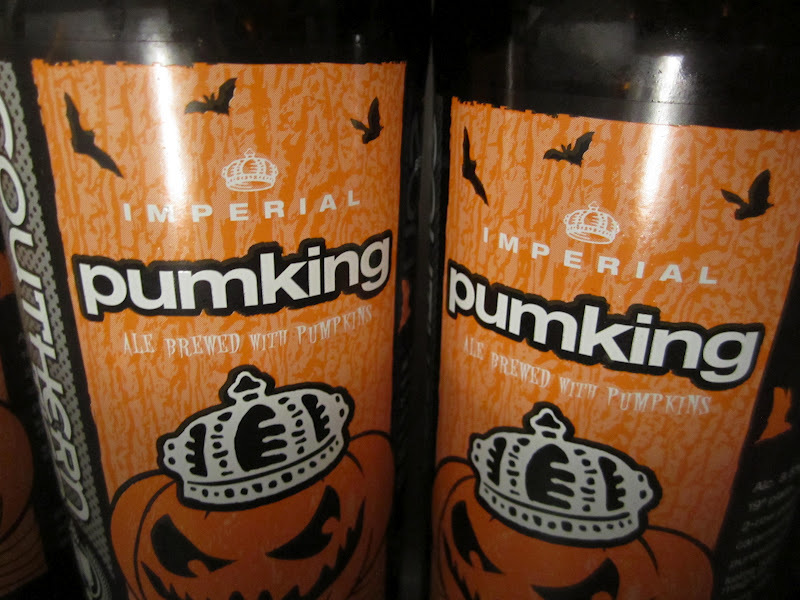 I love pumpkin beer, but have never had this kind. I will have to look for it. My fiance bought some this weekend and we drank some, but I did feel like it was a bit early in the season for pumpkin flavor! I'm still hanging onto summer. I am not a huge pumpkin fan but I do love pumpkin bread, rolls muffins! I know I am like one of the only people in the world that doesn't like the pumpkin spice latte! I love Pumpkin Pie, Pumpkin Spice, Pumpkin Beer - but I need to try that brand... that's hilarious! Haha that sign is too funny! I'm excited for Pumpkin spice to be back but I'm not ready to drink it yet. I think I need to give it a few more weeks. M is not a big pumpkin fan, but he loves fall, which is why we are getting married in October! However, for some insane reason, since the beginning of August M has been able to get Sam Adams Oktoberfest at restaurants and in grocery stores. This annoys him, as he thinks it means they will lose out on having it when it is actually cold, like October and November. He may have a point! DYING over Ian's sign. Omg, hilarious. Also - HOORAY for Pumpkin Spice Lattes! And Congrats to your sister on getting hitched! Pictures soon, please! 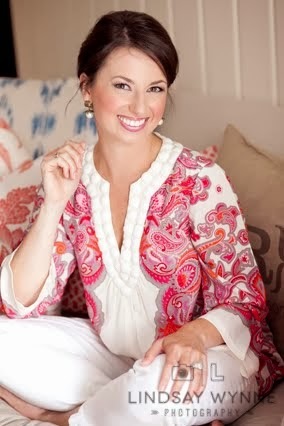 as much as i love summer, i have to admit that when fall sneaks up i get even more excited...football, everything pumpkin i can cook/eat/drink, cooler temps, and boots-perfection in my book!!!! I really don't like beer, but I really like pumpkin beer!! It's so yummy! Is it too early to put pumpkins out yet? My best friend is obsessed with Pumking. I've never had it, so he's taking my first taste very seriously. It's too funny how guys get about things like this. Where can you get that beer? 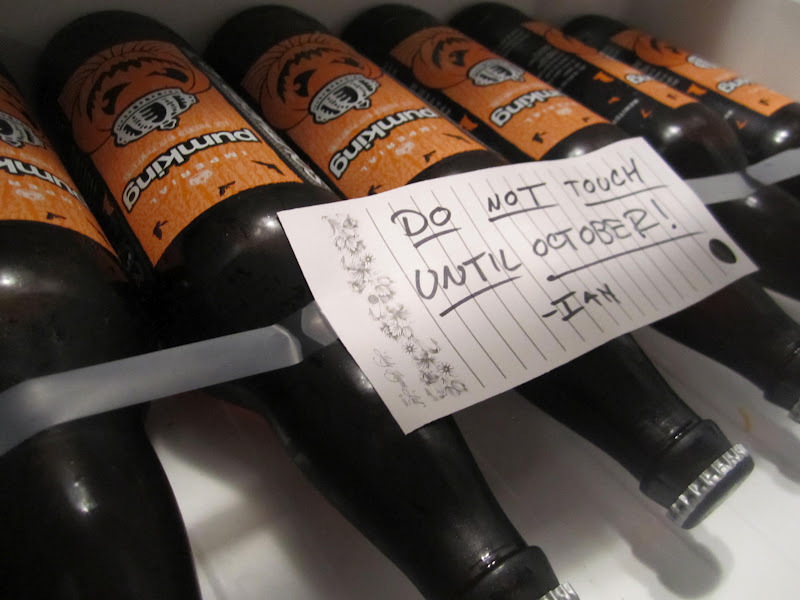 My husband has already busted out the Blue Moon pumpkin spiced ale. So he definitely has to try this one! Lol.